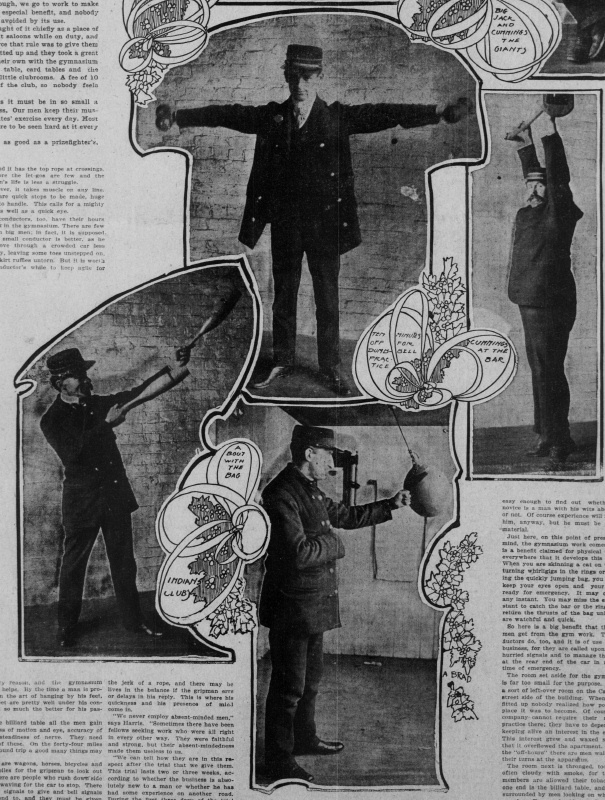 This article, from The San Francisco Call, Sunday, April 13, 1902, was describes physical training of crewmen of the California Street Cable Railroad. It quotes from "The Ballad of the Hyde Street Grip" by Gelett Burgess. Eugen Sandow was a famous bodybuilder. J. W. Harris, Superintendent of the California-Street Cable Railroad Explains the System. IT takes big muscle to guard the grip. That is why we employ big men to do the work. After we have tested them and found them strong enough, we go to work to make them stronger. We have a "gym" for their especial benefit, and nobody knows how many accidents may have been avoided by its use. When I established it for them I thought of it chiefly as a place of recreation. 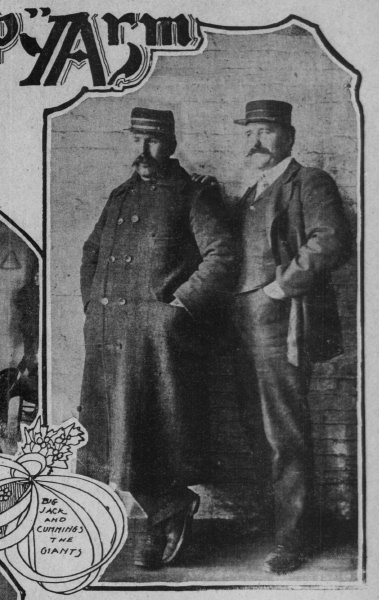 Our men are not allowed to visit saloons while on duty, and it occurred to me that the best way to enforce that rule was to give them something else to visit. So the room was fitted up and they took a great interest in it. 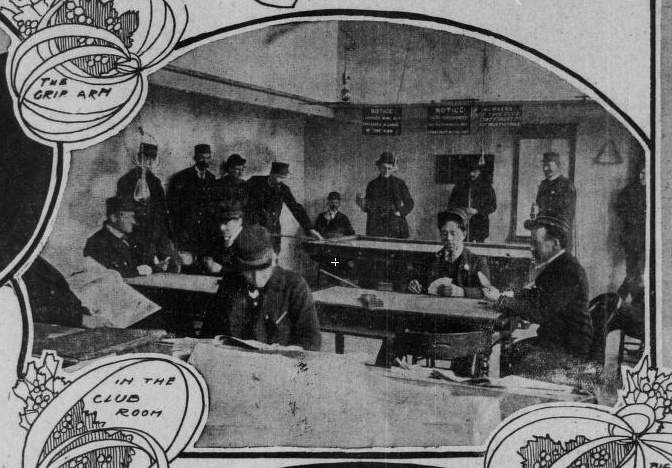 Soon they formed a club of their own with the gymnasium as a nucleus, and now they have a billiard table, card tables and the daily papers all in the power-house in their little clubrooms. A fee of 10 cents a month provides for the expenses of the club, so nobody feels the dues heavy. The gymnasium apparatus is simple, as it must be in so small a space, but it serves its purpose nevertheless. Our men keep their muscles in good training even with a few minutes' exercise every day. Most of them spend a much longer time. They are to be seen hard at it every noon when they are off duty. 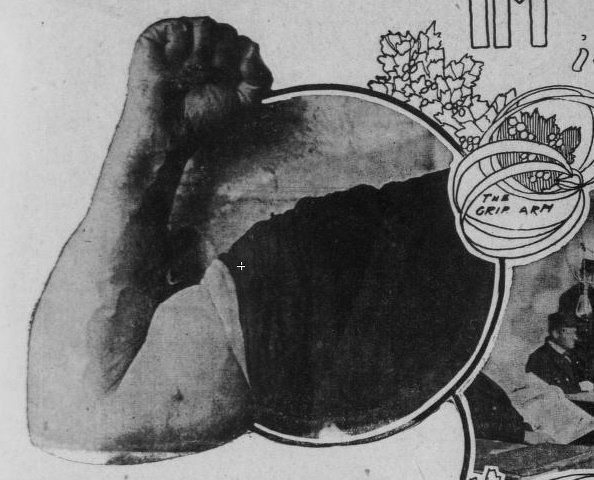 The right arm of the gripman must be as good as a prizefighter's, and we intend to have it so. There's little time for sitting down and little time for gab. For the bumper guards the crossing and you'd best be keeping tab! It takes a bit of doing, on the Hyde street grip! SO sang Gelett Burgess, and so sings every one who knows what the Hyde street gripman's life is. The rain may slant and the norther may blow, and it's little difference it makes to him. He and his big right arm must be there, and the heavier the weather the nastier and harder is she to hold. For the sake of this the big right arm of the gripman must go to school. The school is in the power-house, at the corner of California and Hyde streets. It is a gymnasium, in which the men can swing Indian clubs, raise dumb-bells, practice on the bar and rings and punch the bag. During off-hours the brass-buttoned Sandows drop in and have a swing on the rings or a bout with the bag for the sake of keeping the right arm in perfect form. That Hyde street grip may not seem remarkable to the casual observer, but, as a matter of fact, it is the hardest in town. Not only are the hills heavy, but the "let-gos" are many. When cable lines cross the rule stands that the older line shall be given the top rope. Now, the Hyde street line is, unfortunately, young, and must let its elders take precedence. It has the underneath rope every time. This means that the gripman must let go in order to cross the line having the top rope, and then there is the big yank of taking it up again. This is no work for soft muscle. So in the gymnasium the muscles are toned up. There the men work like prize-fighters in training, cutting their lunch time in order to "stiffen up." "In The Club Room". Even in the original scan, I can't read the text of the two signs that say "NOTICE" and the one that says "REMEMBER". October, 2007 Picture of the Month. J. W. Harris, the superintendent of the road, started the gymnasium a good while ago, and the men took such an Interest in it that a club sprang up and grew about It. Now a billiard-room adjoins the "gym," and there are card tables and newspaper tables to help the men to find amusements in place of those that are forbidden. "Big Jack and Cummings, the Giants"
Cummings and Jackson -- "Big Jack" he is to those who know him -- are the giants of the road, and they intend to keep up their reputation for gianthood. When they leave their cars at 1 o'clock in the afternoon they make for the gymnasium, and there they go at it. Together they weigh 561 pounds. Cummings is a great mountain -- the one who weighs 301, which is a good deal of man. When he goes over the bar it is like the hoisting of a big ox. He is not agile. but he is splendidly strong, and it must be a hard grip which slips his husky hold. His arm is made of iron. He is so tall that when he stands in his place at the grip his head appears to be getting bumped. Big Jack, the other giant, weighs only 260 pounds, which he cannot, to save his life, increase quite to the standard of Cummings. He has as much muscle, though, and he is quick at handling the grip. When Jack punches the bag it dances about like a boy being soundly thrashed. All of the gripmen on the California and Hyde street lines must weigh as much as 175 pounds and be no less than five feet ten inches tall. These are the requirements, and most of the men go a good deal beyond them. So when they get to work in the gym it looks like a lot of giants out for a frolic. The Hyde-street men are the more powerful -- they have to be. They have the hard work. In spite of steep California-street hills that line is looked upon as play, by comparison. It is one of the old lines and it has the top rope at crossings. Therefore the let-gos are few and the gripman's life is less a struggle. However, it takes muscle on any line. There are quick stops to be made, huge levers to handle. This calls for a mighty wrist as well as a quick eye. Clockwise from the top: "Ten Minutes off for Dumb-Bell Practice"; "Cummings at the Bar"; "A Bout With the Bag"; "Indian Clubs"
The conductors, too, have their hours of work in the gymnasium. There are few of them big men; in fact, it is supposed, that a small conductor is better, as he can move through a crowded car less clumsily, leaving some toes unstepped on, some skirt ruffles untorn. But it is worth the conductor's while to keep agile for this veiy reason, and the gymnasium practice helps. By the time a man is proficient in the art of hanging by his feet, those feet are pretty well under his control and so much the better for his passengers. At the billiard table all the men gain quickness of motion and eye, accuracy of touch, steadiness of nerve. They need plenty of these. On the forty-four miles of the round trip a good many things may happen. There are wagons, horses, bicycles and automobiles for the gripman to look out for. There are people who rush down side streets, waving for the car to stop. There are bell signals to give and bell signals to respond to, and they must be given and responded to quickly. One bell means "stop," two bells mean "start," three mean "back." These are the words that the conductor speaks to the gripman by the jerk of a rope, and there may be lives In the balance If the gripman errs or delays in his reply. This is where his quickness and his presence of mind come in. "We never employ absent-minded men," says Harris. "Sometimes there have been fellows seeking work who were alright in every other way. They were faithful and strong, but their absent-mindedness made them useless to us. "We can tell how they are In this respect after the trial that we give them. This trial lasts two or three weeks, according to whether the business is absolutely new to a man or whether he has had some experience on another road. During the first three days of the trial the prospective gripman Is not allowed to touch the levers once. He merely looks on. Standing, behind the experienced man he watches every let-go, every stop, every, start, until he has some idea of the duties of the position. Then he may take the levers, very gingerly at first, while the experienced gripman stands close behind and seizes the brakes when the new man shows the least sign of bewilderment." During this period of probation it is easy enough to find out whether the novice Is a man with his wits about him or not. Of course experience will improve him, anyway, but he must be possible material. Just here, on this point of presence of mind, the gymnasium work comes in. It is a benefit claimed for physical training everywhere that it develops this faculty. When you are skinning a cat on the bar, turning whirligigs in the rings or punching the quickly jumping bag, you have to keep your eyes open and your hands ready for emergency. It may come at any instant. You may miss the exact instant to catch the bar or the rings or to return the thrusts of the bag unless you are watchful and quick. So here is a big benefit that the gripmen get from the gym work. The conductors do too, and it is of use in their business, for they are called upon to give hurried signals and to manage the brake at the rear end of the car in many a time of emergency. The room set aside for the gymnasium is far too small for the purpose. It was a sort of left-over room on the California street side of the building. When it was fitted up nobody realized how popular a place it was to become. Of course, the company cannot require their men to practice there; they have to depend upon keeping alive an interest in the exercise. This interest grew and waxed so great that it overflowed the apartment. Now at the "off-hours" there are men waiting for their turns at the apparatus. The room next is thronged, too. It is often cloudy with smoke, for the club members are allowed their tobacco. At one end is the billiard table, and this is surrounded by men looking on while others play. Two card tables are kept In use a good deal of the time, and the newspapers are in demand. It is for the buying of these papers Chat the 10-cent fee is used. Ten cents a month from each club member is easy enough for each; it is so easy that nobody knows it is missing, and it is sufficient to keep all the news of the day delivered at the room. A gallery runs across one side of the room, a convenient place for brass-buttoned coats to hang while they are off duty. The men seem to enjoy mightily getting rid of the uniform and being their own non-professional selves for a loafing hour. But after a pull at the pipe and, a glance at the paper and a game of cards back they go to the "gym." They all seem to want a awing and a punch before they go back to duty -- just enough of a swing and a punch to send them forth again with a good, stiff feeling in that big right arm. It takes a bit of doing on the Hyde street grip!" Copyright 2007 by Joe Thompson. All rights reserved.